Hackers from the Syrian Electronic Army claimed responsibility for re-directing links sent by President Barack Obama to a pro-Assad video. A pair of tweets sent by President Barack Obama's Twitter account re-directed users to to pro-Bashar al-Assad YouTube videos Monday afternoon. One tweet about immigration reform was supposed to send followers to an article from The Washington Post. Instead, it linked to a video montage of terror attacks, starting with the attacks on 9/11. In a statement to CNNMoney, the hacktivist group known as the Syrian Electronic Army took responsibility for the hack, claiming to have broken into the president's ShortSwitch account -- a link-shortening service. The account, @BarackObama, is used by the president's Organizing For Action campaign. "OFA links that were posted on Twitter/Facebook was hacked and redirected to a video showing the truth about Syria," a member of the Syrian Electronic Army told CNNMoney. The hacktivist group claims that it gained access to multiple OFA email accounts, in addition to MyBarackObama.com and donate.barackobama.com. The two manipulated tweets were retweeted hundreds of times. The links were compromised for part of Monday afternoon before they were once again directed to their intended targets. The hack was likely accomplished by a phishing attack launched against members of Organizing for Action. A member of the SEA sent CNNMoney a screenshot of an organizer's inbox confirming they had accessed her email. 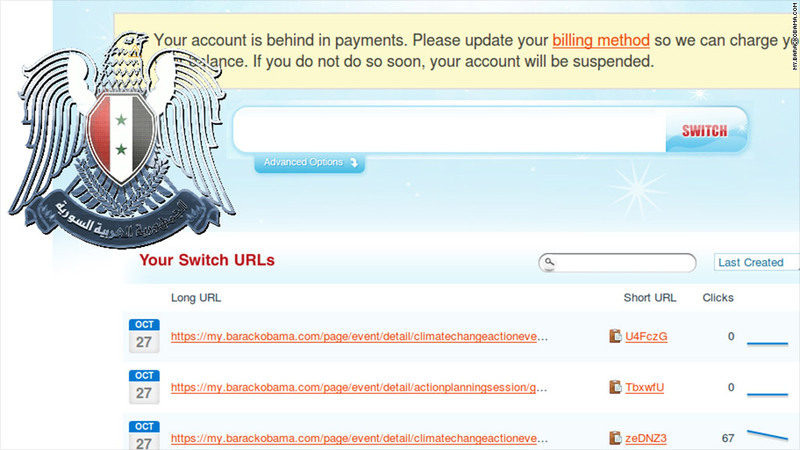 CNNMoney also received screenshots confirming their ability to re-direct links and access BarackObama.com. An official from Organizing for Action acknowledged the attack, telling CNN that "an account to our link shortener was hacked." A spokesman fro ShortSwitch said the site itself wasn't hacked, but the company believes OFA's account credentials were obtained elsewhere. The SEA, which is comprised of hackers supporting Syrian President Bashar al-Assad, have hacked several high profile Twitter handles and advertisements in the past. Though the hack of the president's tweets was relatively minor, security expert David Kennedy said the SEA could expose more if they gained access to other Website and Twitter management tools for the OFA campaign.